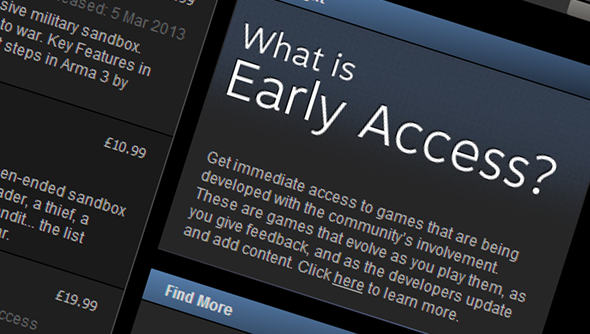 Valve are now letting developers sell alpha access to their games through Steam. You can now, say, buy a copy of Prison Architect and get instant access to the latest build from the alpha and have the game update with each subsequent build automatically. Then when the full game is released you’ll receive a copy of that too. This isn’t an entirely new prospect for Steam, you could, for instance, already purchase an alpha version of Arma 3. What’s changed is that now Valve are creating a section of their store explicitly for these in-development games. They’re calling it Early Access (because alpha wasn’t good enough?). It’s not clear from the Steam page whether the developers will be able to provide alpha access through Steam to people who already own alpha versions of their games. You can read more about each of the games on offer here.